This is #16 in my series of triple radiators the highly requested and hard to find Aquacomputers AMS Copper 360. While the automotive industry and most watercooling radiators utilize a very well refined soldering flat tube and folded fin design, a few have been trying methods of fabrication that don’t require special radiator manufacturing facilities and the AMS is one of those. Rather than your conventional soldered flat tube/two pass design, it uses special round tubes, a four pass design, and acetal ends with rubber gaskets to assemble the end tanks. The fins are also basically formed sheet metal plates that are pressed onto the round tubes and avoids any soldering construction. AMS stands for “Airplex Modularity System” in that this concept is also intended to allow a lego like construction and system that can be altered or modified in a modular way. For example the radiators can be connected side to side and pumps end tanks can replace the normal end tanks. It is put together like a waterblock and can be taken apart as well for cleaning or for modular changes. Last but not least, this is not your typical 120mm wide core, it is essentially a 140mm wide core with extra thickness that has been cut down in length and shrouded for 120mm fans so by frontal area alone it does have some width advantage over the typical 120mm radiator. While I was immediately interested in testing this radiator, I had a hard time finding anyone to sponsor a sample as stock became very limited. I nearly gave up on trying to find one to review until making an effort to ask in the forums if anyone would loan me a sample that they already had. Derelict from the Overclock.net forums was very generous in his offering to send me his pride and joy sample that he purchased himself. Without his generous support, this test/review would not have happened. Thanks! Radiators in all lengths use the same Delrin Terminals, only the side panels and fin packages are different, hence by buying the components, a radiator can be rebuilt and modified. All sizes have a width of 146mm and hence fit perfetly into 5.25″. The height of the radiator in standard configuration (without the pump module) is 63.5mm and the length is 44mm longer than the according fan (e.g. 3x120mm fans -> Length is 360+44mm = 404mm). The connection threads are G1/4″ in size and all 1/4″ fittings from our shop can be used with the system. Of particular interest is the 146mm width which as noted is actually more of a 140mm radiator core width so it is much wider than a normal 120mm radiator. Also not the thickness at 63.5mm is about a tie in extreme thickness as the EK XTX so it’s extra thick as well. Last but not least it is worth noting the “Solderless” construction note since this is done without any soldering construction it also lacks the possibility of residue such as flux and other soldering residue left behind which can be a potential maintenance issue with some conventional rads if they are not flushed and cleaned properly at the plant or by the user before put into normal use. Throughout your site, your performance analysis of PC components is stellar. But results for this radiator are truly puzzling. By now, you must have seen testing of this reservoir by PureOC. And it is very strange that their study contradicts yours. 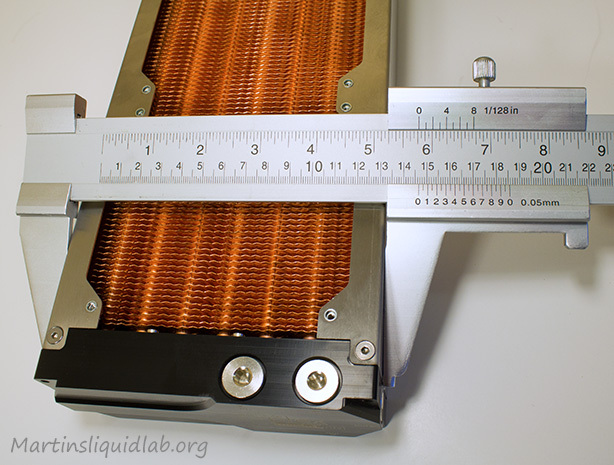 As a heat exchanger, this reservoir shows mundane performance at higher fan speeds in your testing. And these results are entirely opposite those shown by PureOC. As you know, if the reservoirs you are testing are equivalent, thermodynamics requires disparity is limited only to the accuracy of measurements and the testing process. But your revults versus those of PureOC show extreme disparity. Where’s the smoking gun ?? ? I would have to see their logged data to understand, but one methodology spec is alarming. They not testing for 30 minutes and averaging. I have found with larger radiators and water volumes that you can need upwards of 30-40 minutes just to fully stabilize. I have also found that slight rise or drop even if steady can throw results off and typically found it takes at least one trial hour of logging followed by a solid hour of logging to QC and pull out the portion where ambient is level. a typical radiator test require a good weekend to test properly. 30minutes is likely only going to give you results of the warm up. Other things I learned is ambient probe location and logging of rpm. My v1 bench had the ambient sensors too close to the radiator which picked up radiant heat of the radiator. My latest testing I made sure the bench kept them a good 6″ away with air in coming from a collection port with several probes to average the air temp. RPM is the other thing I log because despite your best effort RPM does vary as fans warm up and samples vary as well. My latest bench installed the same exact fan permanently with rpm reading and logging from the same fan. Then there are heat load issues. Voltage in you house also does not remain constant and can easily make a 100w heat load vary by 5w or more. I used a variac as a line conditioner and even with all these extra precautions found the results to only be a out 2-3w in repeatability. Most rad reviews simply do not spend enough time trying to do testing QC work. I also test over multiple fan rpms and plot out a trendline which is another “error” check. Rad testing is by far the most difficult product to do accurately, so there are bound to be conflicting results. Not saying mine is perfect, it’s just another for your information. But you should look for details on the methodology. air flow through the rad makes a big differance, due to its multi pass, if your drawing air from the hot side to the cool side it will keep the cooler side warmer, the cooler side needs to be in the front line of air flow. There are actually three rows of internal tubes. I am not certain, but I also believe the flow path interconnects these from one side to the other on the ams making one long left to right path? The rad certainly did not come with any instructions to suggest air flow must be one direction. I have also seen that suggested with other rads that was debunked with good testing. Anyhow, This was just a loaner test sample so I couldn’t look if I wanted to. In general I haven’t found any radiator prefer flow direction a preference for either water or air when tested, they seem to work exactly the same no matter what orientation. Case direction could matter, but that’s due to case heat build up and how cold the rad intake air is. I am so disappointed in the results for this radiator. Especially since I own a pair of these, but have yet to use them. This is in fact, only the second review I’ve found. There was something I just felt wasn’t right about the review at Pure OC. I had no idea what it was, the review just didn’t seem as if it were performed correctly. Yours, as usual, I trust. I was hoping you’d get to review this radiator, I just wish you could have done it a lot sooner. I definitely wouldn’t have bought these. Even the fans I bought, a set of NoiseBlockers best, are the wrong speed. I guess I’ll be shopping for a new set-up. Probably Alphacool NexXxoS XT45 Full Copper 360mm rads and a set of slower NB fans. Not sure what to do with these AMS 360’s. What’s copper going for these days? I guess the least I should do is give these ago. Any suggestions as to use push-pull or just push? These will be mounted in the top of my CaseLabs T10. I was planning on using a dozen NoiseBlocker fans: Already purchased – 12 NB-eLoop B12-4 88.5 CFM, 2400 RPM, 34.29 db. Like I said, they’re probably too much fan for this rad. It’ll be cooling an i7-3930K and a pair of EVGA GTX Titan’s. Maybe a motherboard block later. Oh, ambient temp. is 72F and 22.22C. Differences between rads is pretty small. Push plus pull is always a benefit no matter what rad, but how much is hard to guess and depends on heat load. make sure you have the air flow the correct direction. Haven’t seen any worthwhile testing show much if any measurable difference on flow direction so I would worry about it much. My sample did not have any directions or suggestions about flow direction either so I wouldn’t worry about it much. Did I misunderstand this review? My 2 radiators are just fine, just not the best there is? I bought them to go with my ultimate water-cooled case, a CaseLabs T10. It’s the computer I’m building with the best parts I can find. I have a dozen Noiseblocker NB-eLoop B12-4 120mmx25mm Ultra Silent Bionic Blade Fan – 2400 RPM, for these rads. Either push and use the other 6 fans elsewhere, or use all 12 as push/pull. Reading the review I suppose I’ll just be using 6 in push. I have a Swiftech MCP35X2 pump I’ll be using for redundancy. I’ll be using either an ASUS Rampage IV Extreme or an MSI Big Bang II, I already own both. I have a pair of i7-3930’s for these boards and may possibly buy an i7-4960X whenever they become available this year. That depends on my finances at the time. I’ll most likely add water-cooling for the boards, and I’ll be using a pair of water-cooled EVGA GTX Titans I already own. Or, maybe, the pair of EVGA GTX 690’s I also own. My ASUS Ares II already has its built on hybrid water-cooler. All the single VGA cards have Alphacool blocks and the cpu block is an Aquacomputer Cuplex Kryos XT Series – .925 Silver Edition for LGA 2011. I was hoping that the pair of these stainless steel and copper AMS rads would be enough for these items, but I have room enough for 2 more if necessary. I’m taking my time with these so I can afford the best parts and buy them as I can afford them. Right now, I’m down to the fittings as I just bought a new BluRay recorder and already have four 500GB Samsung SSD’s for this build, plus a 3TB Toshiba HDD for internal backup and storage. Also a set of Corsair Dominator Platinum 4x4GB 2400MHz sticks. Will these 2 rads be enough or should I buy one or two more? Ambient temp. here in my computer room is 72F 24×7. The room has its own very large air-conditioner I bought just for my computer room. Any suggestions? As I said, this will be my ultimate water-cooled computer case. The motherboards, video-cards and other components may change over the years but this is the last, finest case I’ll ever build. If these rads aren’t going to be up to snuff for at least a decade, please tell me now so I can change to another type as soon as possible. They haven’t been mounted yet so I can sell them on Ebay if I have to. It really doesn’t matter, but I bought the case in reverse configuration as I have already prepared an area to the left of my computer table for it. If I can get CaseLabs to cut me a panel for a Watercool Mo-Ra Pro 120×9 I may just use it. It sure would be easier.